I remember reading an article several years ago in Time magazine (Monday, Apr. 10, 2000) about a debate between Paul Hoffman, former editor of Discover magazine & past president of the Encyclopedia Britannica and John Horgan, author of a controversial book, The End of Science. In the debate, Horgan tried to convince Hoffman that “…we’ve discovered all we can realistically expect to discover and that anything we come up with in the future will be pretty much small-bore stuff.” If you buy this line of thinking, then there is no reason to have any more science fairs! Two teams of scientists, one in Wisconsin the other in Japan, announced their discovery of a way to make stem cells without using embryonic stem cells. The evidence of gravitational waves was discovered. The first self-replicating, synthetic bacterial cell was created. An artificial liver was developed to be used as a bridge for the liver transplant, minimizing the chances of liver failure. The discovery of a previously unknown human ancestor, homo nalendi, was found in a cave in South Africa. The development of the first new antibiotic in 30 years – teixobactin – to fight growing drug-resistance. The World Wildlife Foundation announced the discovery of 211 new species in the Eastern Himalayan region, including 133 plants, 39 invertebrates, 26 fish, 10 amphibians, one reptile, one bird, and one mammal. The Large Hadron Collider (LHC) was built, a 17-mile-long looped track located an average of 300 feet beneath the Earth’s surface under the Swiss-French border, which accelerates two beams of particles to 1.2 trillion electron volts (TeV) and then smashes them together. The solving of the Higgs boson is said to be one of the greatest scientific mysteries of modern times. Scientists at the Genome Sequencing Center report that they have sequenced all the DNA from the cancer cells of a woman who died of leukemia and compared it to her healthy cells. In doing so, the experts found mutations in the cancer cells that may have either caused the cancer or helped it progress. It is the first time scientists have completed such research. Scientists have created a vaccine that seems to reduce the risk of contracting the AIDS virus. Scientists have published the first comprehensive analysis of the genetic code of the Y chromosome. The Hubble telescope has detected the oldest known planet—and it appears to have been formed billions of years earlier than astronomers thought possible, 12.7 billion years ago. Two new solar systems were discovered. The world’s first vaccine was developed against the malaria parasite, which has been shown to be effective against even the most deadliest strains. Jadarite was discovered; it is an essential component in the production of batteries for cellphones, computers, and electric or hybrid cars. Exoplanets have been confirmed to exist revolving around distant stars similar to our sun. As a result, we may begin a rethinking of the universe and our place within it. A vaccine preventing cervical cancer was developed. Then, there were the inventions of the iPod, the iPhone, hybrid cars, the Segway transporter, 3-D printing, augmented reality, and using water as fuel. While there may be a debate about which of these or other discoveries are the Top 10 of the past fifteen years or so, there should be no question that the above evidence illustrates how important it is to train and support the next generation of scientists. What do Bill Gates and Marconi have in common? I recently read a quote from the most influential physicist of the 20th century, Albert Einstein, and it immediately made me LOL (laugh out loud). Einstein said, “A person who has not made his great contribution to science before the age of thirty will never do so.”( Brodetsky, S. Nature 150, 698-699 (1942). I don’t know why I thought the quote was funny, but it brought to mind the importance of getting students interested in science and the “wow factor” of scientific discovery, at as young an age as possible. Research indicates that the most recent Nobel Prize winners made their discoveries in mid-life (late 40s) and, that NIH grants have been awarded in recent years to more established scientists (late 40s), But there are many scientists including Einstein, who made incredible discoveries or who developed inventions in their 20s. Among the youngest of the bunch includes Microsoft founder Bill Gates and Guglielmo Marconi, the inventor of the radio. James Watson was only 25 when he wrote one of the most important scientific papers of all time about DNA. Isaac Newton was 23 when he began inventing calculus. Galileo published his first piece of writing at age 22. Edwin Armstrong, an electrical engineer who was fascinated by radio from childhood, built a 125-foot-tall antenna in his front yard at the age of 20; within two years he invented the continuous-wave transmitter and the regenerative circuit which developed the backbone of radio communications as we know it, and later invented FM Radio. Younger scientists and inventors also include Apple co-founder Steve Jobs, noted chemist Glenn Seaborg, and Danish Nobel Prize winning physicist Neils Bohr who developed the model of the atom and who’s one of the scientists featured in a book for children from the Galactic Academy of Sciences: The Desperate Case of the Diamond Chip. The one thing all the “younger scientists” mentioned above, seem to have in common is an inquisitive mind. The story is told about Einstein’s curiosity at a young age about the pocket compass his father showed him, and Einstein’s interest in what made the needle move despite the “empty space.” Bill Gates developed a fascination about computer programming when he was a teenager, and spent countless hours learning how to do different things with source codes and computer languages before anyone else his age at the time. With Glenn Seaborg, it was a high school science teacher that spurred his interest in chemistry, and in college Seaborg learned to ask relevant questions in his dealings with Berkeley physicist Robert Oppenheimer, who later became the director of the Manhattan Project. Several years ago, Francis Collins, the director of the NIH, stated in a Wall Street Journal article (“Fleeting Youth, Fading Creativity,” February 2010) “researchers in the early stages of their careers tend to be the ones with the fire in the belly. They’re not afraid of tackling the really hard problems.” As a result, Collins further went on to say the NIH was intending to increase the percentage of grants going to scientists applying for their first grant. Discoveries by younger scientist may be more commonplace over the next decade as a result of the response by the NIH and because of the Next Generation Science Standards. These new standards, mentioned in one of my earlier blogs, will result in more teaching and testing of students on STEM (Science, Technology, Engineering and Math) literacy in elementary, middle and high schools across the USA. Encourage a youngster you know to get interested in science. Bill Gates was 13 years old when he developed an interest in the then growing field of computer programming. Within a few years, he found ways to access computer time at local computer companies. By the time he was a college sophomore, he was devising solutions to complex and unsolved math problems with his programming skills. Before his 32rd birthday, Gates had become the world’s youngest self-made billionaire. What most people do not associate with Gates, is the word ‘risk’. But Bill Gates had to go through the same trials and tribulations that most scientists and entrepreneurs have to go through to achieve their goals. Don’t Attack the Science Fair Project – Embrace It! I was upset last year when I saw this photo, below, printed in the Huffington Post and circulate through social media. It seems like every year there is the angst that a science fair project assignment creates for many students and their families. It’s unfortunate that science fairs and independent research projects seem to get attacked this way. As a new school year kicks off, it’s a great time for parents to take a fresh look at what science fair is all about, the role parents should play, and what everyone involved can do to make the process less stressful for all involved and a success. To start with, attitude plays a huge role in how students approach their science fair project. Maybe you had a bad experience with a science project as a child, but adults need to put that experience behind them and to understand the process so that if they encourage their child with a positive perspective, the end result may not be as traumatic. 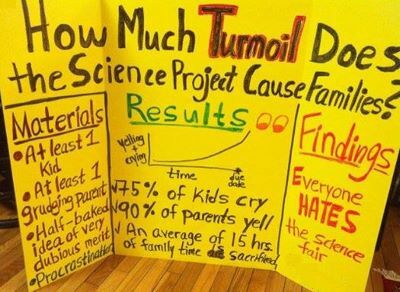 For whatever reason you cringe at the thought of a science fair project, you are not alone. But instead of shying away from it you need to embrace it because even though your child may not grow up to be a scientist, the learning that happens by doing a hands-on science project is enormous. For starters, it integrates almost every skill children have been taught and 21st Century skills your child needs to experience from reading, writing, research, math and critical thinking, to computer science, graphic arts, public speaking, gaining confidence and the thrill of discovery. As a parent, you should encourage all this blended learning rather than discourage it. So before you groan, and before you allow your child to complain about his or her science fair project, realize that your response might have an impact on it being a positive experience and a great learning opportunity. And, let’s not forget that if your child is selected to go on to local or national competition, it can pay off in cash or other prizes, and may open the doors to internships and scholarships. What’s the best reaction you can have when you discover there’s a science project due? How about saying something like, “Wow, that’s great, maybe you can do a project about [insert your child’s favorite hobby, interests, subject, etc. here]. Then, help them get started right away. Elsewhere on this website you’ll find information about how to get started, and how to choose a science fair topic if you don’t already have ideas. If you have any questions, please don’t hesitate to contact us: info (at) MisterscienceFair.com or via our web contact form. Make sure you also regularly check our Facebook page for on-going ideas and information about other competitions you can enter. 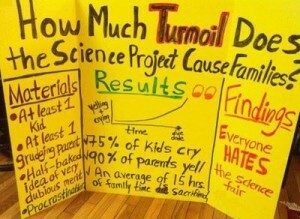 We know this is not a real science fair project (this never made it to a science fair – it stays permanently in the home of a very frustrated mom who made this project to show her frustrations - see Huffington Post article here). Don’t let this happen to your family. Don’t start your child’s science fair experience off on the wrong foot! Informal science education, such as the type of learning a student gets outside of the normal classroom environment by participating in a science fair, provides kids with an in-depth and hands-on look at “real world” science. While it’s possible that participation in a science fair can open doors for students who have already discovered their abilities and passion for science, it can also help students develop an interest in science which could be important to them no matter which career they choose. Some of the most important arguments for the Next Generation Science Standards are: 1) American students are falling behind in math and science, performing at levels below students in competitor nations on international tests. In the most recent results, the United States slipped from 25th to 31st in math since 2009; and from 20th to 24th in science; 2) fewer students are pursuing careers in Science, Technology, Engineering and Math (STEM) disciplines, and 3) science is profoundly important to address the problems we’re now facing such as preventing and curing diseases, maintaining supplies of clean water and addressing the energy crisis. Source: Programme for International Student Assessment, OECD, 2012. Our collective futures are dependent upon students being interested in science. The purpose of more science education, broadly expressed as ‘STEM literacy’ is to motivate all students (not just the parents and students who are already a fan of science) to fully engage in the very active practices of science and engineering. Aside from the movement to provide 100,000 STEM teachers over the next decade, the other important reason to help your child become interested in science is that through the Next Generation Science Standards, students will be tested on STEM literacy in school. Scientists are no longer just a bunch of old men in white coats with goggles, pens in pocket protectors, grumpy attitudes and an inability to talk about anything other than research. Elon Musk, at 36 was named Entrepreneur of the Year. Why? Because by then he was already the CEO of Telsa Motors and Solar City, was co-founder of Paypal and was the then head-rocket-designer for SpaceX. 38-year-old Mayim Bialik who plays a neuroscientist on The Big Bang Theory has a PhD in Neuroscience in real life! A non-scientist – but someone who has an interest in, and an understanding of science – might be the salesperson at the appliance store who can help you select the most cost-effective furnace, or the grocery store clerk who understands the potential for botulism if meat isn’t properly refrigerated, or the politician who’s fighting for a clean-energy policy. 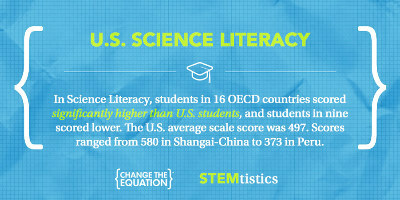 Science is all around us, and it benefits everyone at every age, to become more science literate. My son’s avowed interest in all-things-dinosaurs from the age of ten, combined with the boundless sense of wonder that all kids have, made it possible for him to use his four high school science fair projects to interpret the microstructures of dinosaur eggshells in some ways other scientists had not previously thought of. As a result, he delivered a presentation to more than a thousand scientists at the annual Society of Vertebrate Paleontology Conference — at the age of 20. Informal science education, such as the type of learning a student gets outside of the normal classroom environment by participating in a science fair, provides kids with an in-depth and hands-on look at “real world” science. While it’s possible that participation in a science fair can open doors for students who have already discovered their abilities and passion for science, it can also help students develop an interest in science which could be important to them no matter what career they choose. Getting students interested in hands-on science now is actually very important for another reason, since a new national set of science education standards is under development. The Next Generation Science Standards have a targeted release date of 2013. Some of the most important arguments for the Next Generation Science Standards are: 1) American students are falling behind in math and science, performing at levels below students in competitor nations on international tests; the United States currently ranks 25th in math and 17th in science among developed nations, 2) fewer students are pursuing careers in Science, Technology, Engineering and Math (STEM) disciplines, and 3) science is profoundly important to address the problems we’re now facing such as preventing and curing diseases, maintaining supplies of clean water and addressing the energy crisis. In essence, the new standards recognize that “science, engineering and technology permeate every aspect of modern life” and that by the time a student graduates high school they “should have sufficient knowledge of science and en­gineering to engage in public discussions on science-related issues, to be critical consumers of scientific information related to their everyday lives, and to be able to continue to learn about science throughout their lives.” (See the Report Brief from the Framework for K-12 Science Education for more details.). Being a scientist or having an interest in science is no longer relegated to a bunch of old men in white coats with goggles, pens in pocket protectors, grumpy attitudes and an inability to talk about anything other than research. A scientist can be someone who is 20 or 30 years old and who digs dinosaur eggs in the Montana badlands, does all his communication through a PDA, excitedly jumps up and down upon finding a 20-million-year-old fossil of a previously undiscovered life-form, and enjoys talking about music and videos and computer games and lots of other things with his friends. 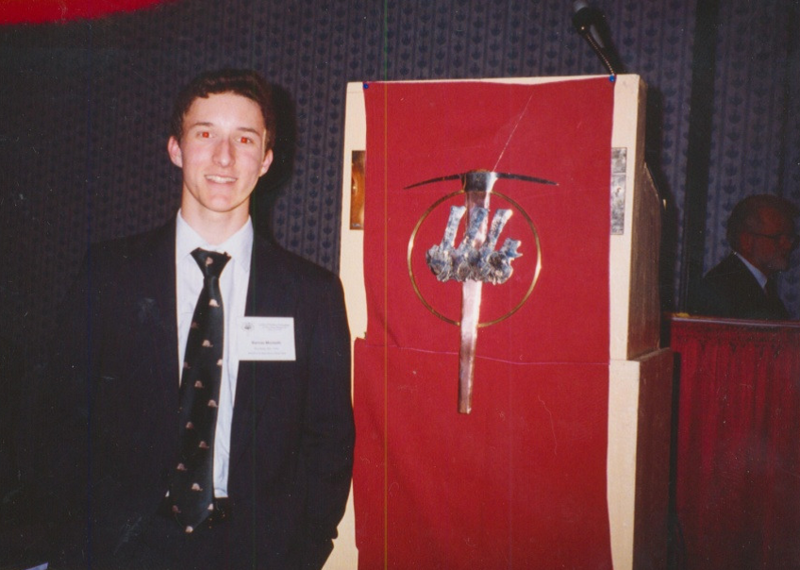 As a college junior, Barnas Monteith was given the distinct honor of being the youngest person to give a Plenary session lecture before the Society for Vertebrate Paleontology, which is the central professional organization for dinosaur paleontologists from around the world. Barnas’ interest in dinosaurs since he was six years old, led to his cross-disciplinary study of eggshells for his four years of high-school science fair projects.